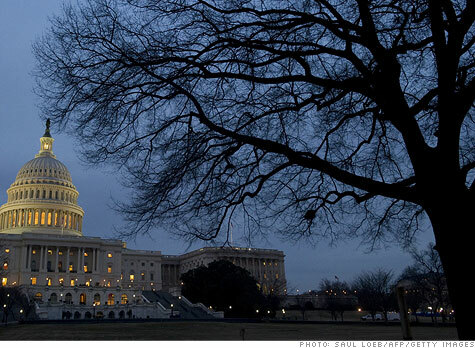 NEW YORK (CNNMoney) -- If Congress fails to approve a spending bill by Friday, the federal government will shut down. And boy, things aren't looking good. Lawmakers have been trying to reach a compromise that would set spending levels for the next six months. Those negotiations continued Tuesday at the White House, and it appears things did not go well. After the meeting, House Speaker John Boehner accused the White House of proposing cuts that amount to "smoke and mirrors." And President Obama made a rare appearance at the White House press briefing, where he berated Republicans for including hot-button political initiatives in their proposal. It appears the two sides are still billion of dollars away from striking a deal. With time running out, a shutdown is looking ever more likely. If it comes to that, agencies won't be able to spend money, and parts of the federal government will close up shop. Which services would stop? During the last major shutdowns in the final days of 1995 and early 1996, the government closed 368 National Park Service sites, along with national museums and monuments. In addition, 200,000 passport applications went unprocessed and toxic waste cleanup work at 609 sites stopped. The National Institutes of Health stopped accepting new clinical research patients and services for veterans, including health care, were curtailed. Work on bankruptcy cases could slow. In the last shutdown, more than 3,500 cases were delayed. Which services would the government keep running? Agencies are allowed to perform any operations necessary for the safety of human life and protection of property. The government would keep essential services -- such as air traffic control and the national security apparatus -- in full operating mode. Federal workers who provide medical care on the job would be kept on, as would employees who handle hazardous waste, inspect food, patrol the borders, protect federal property, guard inmates or work in power distribution. Workers who protect essential elements of the money and banking system would also report to work. The Postal Service, which is self-funded, will continue to operate. How many federal workers would be furloughed? The government went dark twice during the Clinton administration: Some 800,000 workers were sent home during the first shutdown and 284,000 were sent home during the later shutdown. It is unclear how many workers would be furloughed in a new shutdown. Each federal agency has its own plan to wind down operations, and administration officials have not released details. Will Social Security benefits be mailed? During the last major shutdown, the Social Security Administration mailed checks throughout the crisis, and a close reading of established law makes clear the agency has the legal authority to do so again. During the Clinton-era shutdown, new Social Security claims weren't being processed because the agency furloughed 61,415 employees. As the shutdown wore on, the agency adjusted its plan and recalled workers to start processing new claims. Will troops overseas get the resources they need? Yes. While some Pentagon activities would stop, it would continue many other operations necessary for the safety of human life and protection of property. However, the Department of Defense says that if the government shuts down for an extended period, troops might not be paid on time. How long will a shutdown last? Hard to say. Between 1977 and 1980, there were six shutdowns ranging from eight to 17 days. Nine shutdowns occurred between 1980 and 1995, and none lasted longer than three full days. The Clinton-era shutdowns lasted five days and 21 days. Since that episode the federal government has suffered no similar shutdown. Most political strategists agree that the Clinton-era shutdowns politically benefited the sitting president, who was able to paint Republicans as obstructionist. If a shutdown does come to fruition, the current crop of Republicans will be looking to avoid the same fate. How did we get here? Typically, lawmakers pass 12 appropriations bills for the president's approval. Those bills give federal agencies the legal authority to spend and conduct business. This year, not one of the 12 has been approved by the Senate. Instead, lawmakers have relied on continuing resolutions. If lawmakers are able to pass another short-term fix, it would be the fifth of the fiscal year.